Riyad Mahrez's fourth goal of the season quickly cancelled out Tottenham's opener and maintained Leicester's unbeaten start. Tottenham broke the deadlock with nine minutes to go when Dele Alli converted Nacer Chadli's cross from close range. But Mahrez, who had earlier hit the post, replied just 90 seconds later with a fierce left-footed finish. The Foxes went closest to victory when Hugo Lloris saved Wes Morgan's header, but they still moved top of the table. Claudio Ranieri's side are above Manchester United on goal difference after three games, although Manchester City and Liverpool can leapfrog them later this weekend. England manager Roy Hodgson names his squad for September's Euro 2016 qualifiers against San Marino and Switzerland next week and was at King Power Stadium to check on Tottenham's Harry Kane and Leicester's Jamie Vardy. Both forwards were involved in their side's goals, with Kane helping to start the move that ended with Alli heading home from close range, and Vardy's header giving him an assist even if Leicester's goal owed much more to Mahrez's magic. Vardy was his usual energetic self, causing Spurs plenty of problems without ever looking like finding the net himself. 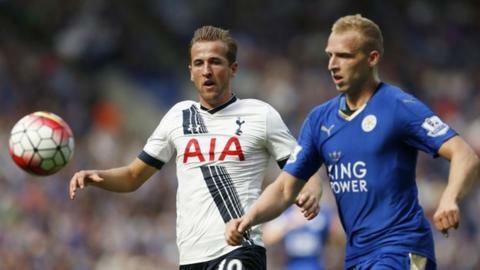 Kane, who is yet to score this season after notching 31 times in 2014-15, had a poor first half but showed flashes of his old self in the second period, notably when he forced his way past two Leicester defenders and forced Kasper Schmeichel into a save. But it was Mahrez who was the game's star performer. The Algerian's goal capped another fine display on the wing and he always looked dangerous when he came inside and ran at the Tottenham defence. Spurs boss Mauricio Pochettino said before the game that his need for another striker to help Kane was "obvious". He will not have seen anything against the Foxes to change that opinion, with West Brom's Saido Berahino looking like the leading contender to plug that gap. What will also concern Pochettino is his side's lack of creativity against Leicester with Christian Eriksen absent with a knee injury. Eriksen's absence left Mousa Dembele, Nacer Chadli and Erik Lamela as the attacking trio behind Kane. Dembele had a couple of shots from distance in the first half, Chadli set up Spurs' goal, but Lamela was again ineffective as Tottenham struggled to turn their superior possession into chances. Leicester boss Claudio Ranieri: "Tottenham kept possession of the ball but we created the same chances and 1-1 is the right result. "I am happy, My players have a fantastic spirit. It was an outstanding goal and Riyad Mahrez is a very good player. "It is important to maintain our place in the Premier League. Seven points, 33 less, that is important for us." Tottenham head coach Mauricio Pochettino: "It was 50/50, a very difficult game for both teams. Second half we played much better. "I am disappointed with the draw. Last game against Stoke we lost a 2-0 lead and we did it again. We deserved more again but it is a shame. "I am angry and disappointed, not frustrated. The mistake we made today is difficult to explain." Leicester City have won 29 Premier League points since 1 April; more than any other side. Mahrez has scored six goals in his last six Premier League appearances, including four in his three PL games in 2015-16. Spurs' Dele Alli scored his first Premier League goal in this match and at 19 years, 132 days is the youngest player to score for Tottenham in the PL since Gareth Bale (18 years, 60 days) netted against Arsenal in September 2007. Match ends, Leicester City 1, Tottenham Hotspur 1. Second Half ends, Leicester City 1, Tottenham Hotspur 1. Attempt blocked. Toby Alderweireld (Tottenham Hotspur) right footed shot from a difficult angle on the left is blocked. Corner, Tottenham Hotspur. Conceded by Jeffrey Schlupp. Attempt saved. Dele Alli (Tottenham Hotspur) right footed shot from very close range is saved in the centre of the goal. Assisted by Harry Kane. Substitution, Tottenham Hotspur. Nabil Bentaleb replaces Ryan Mason. Attempt saved. Wes Morgan (Leicester City) header from the centre of the box is saved in the centre of the goal. Assisted by Riyad Mahrez with a cross. Attempt missed. Gökhan Inler (Leicester City) left footed shot from outside the box is high and wide to the left. Assisted by Ritchie de Laet. Attempt blocked. Andy King (Leicester City) right footed shot from the centre of the box is blocked. Attempt blocked. Jamie Vardy (Leicester City) right footed shot from outside the box is blocked. Gökhan Inler (Leicester City) wins a free kick in the attacking half. Ryan Mason (Tottenham Hotspur) is shown the yellow card for a bad foul. Foul by Ryan Mason (Tottenham Hotspur). Goal! Leicester City 1, Tottenham Hotspur 1. Riyad Mahrez (Leicester City) left footed shot from the right side of the box to the top left corner. Assisted by Jamie Vardy with a headed pass. Goal! Leicester City 0, Tottenham Hotspur 1. Dele Alli (Tottenham Hotspur) header from very close range to the bottom right corner. Assisted by Nacer Chadli with a cross. Substitution, Leicester City. Gökhan Inler replaces Daniel Drinkwater. Substitution, Leicester City. N'Golo Kanté replaces Marc Albrighton. Substitution, Tottenham Hotspur. Tom Carroll replaces Mousa Dembélé. Riyad Mahrez (Leicester City) hits the right post with a right footed shot from the right side of the box. Assisted by Jamie Vardy. Offside, Leicester City. Ritchie de Laet tries a through ball, but Shinji Okazaki is caught offside.